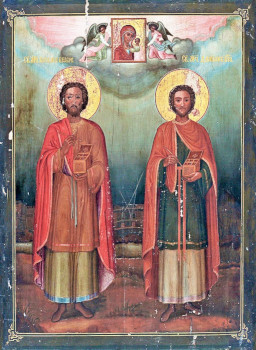 Saints Cosmas and Damian were natives of Asia Minor. Their father, a pagan, died while they were still quite small children. Their mother, Theodotia, raised the brothers in Christian piety. The example of their mother and the reading of holy books preserved them in chasteness of life in accord with the command of the Lord, and Cosmas and Damian grew up into righteous and virtuous men. Trained and having become skilled as physicians, they acquired a graced gift of the Holy Spirit – to heal by the power of prayer people’s illnesses both of body and soul, and they treated even animals. With fervent love for both God and neighbour, the brothers went forth into social service. For the maladies which the brothers treated they never took payment, and they strictly observed the command of our Lord Jesus Christ: “Freely have ye received, freely in turn give” (Mt. 10: 8). The fame of Saints Cosmas and Damian spread throughout all the surrounding region, and people called them unmercenaries. One time the saints were summoned to a grievously ill woman whom all the doctors had refused to treat because of her seemingly hopeless condition. Through the faith of Palladia (thus was her name) and through the fervent prayer of the holy brothers, the Lord healed the deadly disease and she got up from her bed perfectly healthy and giving praise to God. In gratitude for being healed and wanting them to accept a small gift from her, Palladia went quietly to Damian. She presented him with three eggs and said: “Take this small gift in the Name of the Holy Life-Creating Trinity – Father, Son, and Holy Spirit.” Hearing the Name of the Holy Trinity, the unmercenary one did not dare to refuse. Cosmas, however, when he learned of what had happened, became very sad. He thought that his brother had broken their strict vow. And soon approached the time when Saint Cosmas was to expire to the Lord. Dying, he gave last instructions that his brother should not be buried alongside him. After a short while Saint Damian also died. All were greatly perplexed where Saint Damian’s grave should be. But through the will of God a miracle occurred: there came to the people a camel, which the saints had treated for its wildness, and it spoke with a human voice saying that they should not doubt to put Damian alongside Cosmas, because it was not for the reward that Damian accepted the gift from the woman, but on account of the Name of God. The venerable remains of the holy brothers were buried together at Theremanea (Mesopotamia). Many miracles were worked upon the death of the holy unmercenaries. There lived at Theremanea, nearby the church of Cosmas and Damian, a certain man by the name of Malchos. One day in setting off on a distant journey, and leaving behind his wife all alone for what would be a long time, he prayerfully entrusted her to the heavenly protection of the holy brothers. But the enemy of the race of mankind, having taken hold over one of Malchos’ friends, planned to destroy the woman. A certain while went by, and this man went to her at home and said that Malchos had sent him to take her to him. The woman believed him and went along. He led her to a solitary place and wanted to molest and kill her. The woman, seeing that disaster threatened her, called upon God with deep faith. Two fiercesome men then appeared, and the cunning man let go of the woman, and took to flight: he fell off a cliff! The men led the woman home. At her own home, bowing to them deeply she asked: “What name do they call you, my rescuers, to whom I shalt be grateful to the end of my days?” “We are the servants of Christ, Cosmas and Damian,” they answered, and became invisible. The woman with trembling and with joy told everyone about what had happened with her, and glorifying God she went up with tears to the icon of the holy brothers and offered up prayers of thanks for her deliverance. And from that time the holy brothers were venerated as protectors of the holiness and inviolability of Christian marriage, and as givers of harmony to conjugal life. And from ancient times their veneration spread also to Russia.